The High Technology Series includes four fireplace models: the Z-MAX (HT), Chalet (HT), Chalet (HT) See Through, and the Great Room (HT). These are our legacy products and were built to give you the ultimate wood burning experience. Air within your home is drawn in through the lower grill by a thermostatically-controlled fan. The air is forced through the back passage of the system and is circulated then vented back into the space through top vents. All our high-tech fireplaces can be made for zero clearance installation and all (excluding Z-MAX) can be made to accommodate a Masonry installation. The Chalet (Single Sided) and the Great Room (Single-Sided) both use the 14 tube heat exchange system. This system allows these fireplaces to heat a massive 4,000 square foot home with a whopping 180,000 BTU maximum output. The air within the room enters the 14 tubes and is heated by the firebox. That additional heated air is then released back into the home. These 2 fireplaces work hand-in-hand with our whole home heating and water loops for an unmatchable fireplace heating system. The Z-MAX is our “small but mighty” high-tech fireplace. 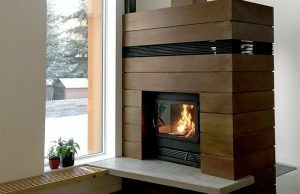 The Z-MAX is designed with the efficiency of a wood stove and the beauty of a fireplace. Outside combustion air enters the z-max firebox in 4 locations. The first and primary is the air wash. The secondary combustion enters at the top of the firebox, lined firebrick. The smoke from the fire hits the secondary combustion tube and rebut a the smoke. Increasing heat output and efficiency, as well as limiting the amount of smoke exiting the flue. On either side of the firebox there are stall out / start up tubes in the firebrick. When you are starting the fire, air enters under your wood aiding in the ignition of the wood- similar to blowing air under your kindling. When your fire is going out at the end, the stall out tubes force additional air to burn every log and coals complete to fine ash. This fireplace can heat up to 3,000 square feet with an impressive 130,000 BTU maximum output. The Chalet (See-Through) is the only high-technology fireplace that provides two views in one fireplace with a notable heat output. The air within your home enters into the bottom grill and heated around the firebox. The heated convection air rises up and circulates out the upper grill. When the doors are closed the fireplace uses 100% outside air for combustion. No air from within your home is lost up the flue. Imagine having even temperatures throughout your home (no cold spots), and/or supplemental heat you can use at your discretion. Lower or eliminate your gas and electric heating bills this season by heating all of your air and supplementing the heating of your water with our Whole Home Heating System and Water Loop. Acucraft’s Whole Home Heating System works best with our High-Technology Fireplaces but works well with the Hearthroom and the Unity as well. Combined with our Water Loop, you will have the ultimate heating set up. We’ve been producing wood burning fireplaces for over 39 years, we know how to do it and we do it well. Acucraft’s Water Loops can be added to your fireplace. They allow you to heat your domestic water and/or can also be used for radiant in-floor heating systems. A small pump circulates the heated water, which can be tied into various heating systems. Common uses are in-floor radiant heating systems and domestic hot water. It is possible to add 2 water loops to one fireplace and double the output. The in-line blower blower is controlled with a thermodisc. The blower will automatically turn on once the fireplace gets hot; it will also turn off as the fireplace cools down or the fire goes out. For More Photos and Information, Request Your Wood Burning Fireplace Catalog Today! "We received the fireplace today and I'm going to go ahead and tell you that we are going absolutely love the fireplace. It's bigger and better than I ever thought it would be."